Amendment of GOI, MOD letter No.1(2)/2016-D(Pen/Pol) dated 30.09.2016 and revision of pension of Pre-2006 pensioners (JCOs/ORs and Commissioned Officers) delinking of qualifying service of 33 years for revised pension. Subject: Amendment of GOI, MOD letter No.1(2)/2016-D(Pen/Pol) dated 30.09.2016 and revision of pension of Pre-2006 pensioners (JCOs/ORs and Commissioned Officers) delinking of qualifying service of 33 years for revised pension. Copy of GoI, MoD letters No.1(2)/2016-D(Pen/Pol) dated 11.10.2017 and 22.12.2017 are forwarded herewith for further necessary action at your end. 2. 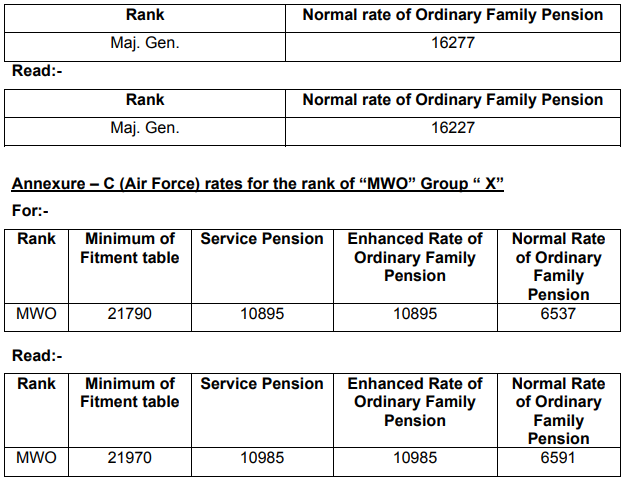 Minimum guaranteed pension table for all the ranks of Defence Forces Personnel for service pension and family pension have been issued vide GoI, MoD letter No.1(2)/2016-D(Pen/Pol) dated 30.09.2016 (Circular No.568 dated 13.10.206). Note:- Rates of pension indicated in Annexure-B (Army) is also applicable for the revision of pension in respect of NCs (E) of Army as per rates applicable for Sepoy Group "Z". 2. DoPT, vide their OM No.3/3/2016-Estt. (Pay II) dated 01.05.2017 have issued instructions for revision of ignorable amount of pension from Rs.4000/- to Rs. 15000/- (Rupees Fifteen Thousand) for the purpose of fixation of pay in the re-employment post. Accordingly, the amount Of Rs. 4000/- appearing in this Department's 0M dated is revised as Rs. 15000/- (Rupees Fifteen Thousand). The other conditions for grant of dearness relief In OM dated 02.07 1999 remain the same. 1) Secretary General, National Federation of postal Employees (NFPE). 2) Secretary General, Federation of National postal Organisations (FNPO). 3) Secretary General, Bharatiya Postal Employees Federation (BPEF). Subject: Holding of Periodical meeting with Associations atliliated with NFPE, FNPO and BPEF and also Non-Federated Associations. It is, therefore, requested that General secretaries of the affiliated Associations may be asked to furnish agenda items (maximum three items and items should not be bifurcated) for the said meeting in respect of recognized Associations to your Federations, by 2nd March, 2018 positively to enable us to take further necessary action. The number of sanctioned posts and number in position in various Ministries/Departments as available in the Annual Report on Pay and Allowances of Central Government Civilian Employees 2016-17 as on 1.3.2016, published by Pay Research Unit, Department of Expenditure, Ministry of Finance, is at Annexure 'A'. The posts sanctioned in Ministries/ Departments are required to be filled as per the Recruitment Rules as and when vacancies arise. A number of steps have been taken for streamlining the procedure for conducting meeting of Departmental Promotion Committee (DPC) for promotions which includes issue of model calendar for conduct of DPCs, the reckoning of APARs for consideration of promotion etc. Steps have also been taken for streamlining direct recruitment process by doing away with interviews for lower level posts, introduction of computer based examinations and simplification of pre-appointment procedures. As on 01.04.2017, over Zonal Railways, total number of employed staff in loco running category is 87196. As per the provision of the Railways Act, 1989 and the Railway Servants (Hours of Work & Period of Rest) Rules, 2005, Loco running staff on the Railways are classified as 'Continuous' and as such, their rostered hours of work is 54 hours a week on an average in a two-weekly period of 14 days. After the Seventh CPC (Central Pay Commission) recommendations, the basic pay of the non-running staff has been increased by a multiplication factor of 2.57 with effect from 01.01.2016 and then fixed in the appropriate cell of the relevant Level in the Seventh CPC pay matrix, while for the running staff the multiplication factor of 2.945 was used. Further, the actual raise in the pay of the running staff has been ensured at a minimum of 14.29 percent with the Ministry of Finance (MoF) concurrence. This has resulted in an effective multiplication factor of around 3.01 for Running Staff. The running staff also get allowances like Dearness Allowance and House Rent Allowance on the basic pay enhanced by 30%. This was stated by the Minister of State for Railways Shri Rajen Gohain in a written reply to a question in the Parliament on 9.2.2018.